A dental crown, or dental cap, is one of the most common dental procedures used to treat dental problems. 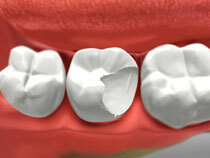 Besides treating decay, crowns can restore teeth that are chipped, cracked, stained or broken. This makes these dental restorations well-suited for treating a wide selection of dental problems. So how are dental crowns different from other types of dental restorations? The first thing to realize is that other types of restorations, such as bonded fillings, porcelain inlays / onlays, only treat a specific section of a tooth’s surface. 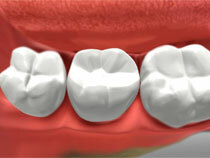 In comparison, a crown treats the entire visible surface area of a tooth. Once the decayed or problematic portion of a tooth is removed, a crown is placed over the tooth and covers the whole surface above the gumline. This means that crowns are highly effective for treating teeth that have large areas that are damaged or decayed. However, one commonality that dental crowns and bonded fillings have is that they are often made from the same materials. Just like fillings, crowns can be made from a number of different materials, such as gold alloy, porcelain or ceramic. Each material has its strengths but porcelain crowns have proven to be popular with our patients. Why? The reason is that porcelain is strong, durable, and attractive looking. Unlike metal which is highly noticeable, porcelain can be matched to the unique shade of your teeth which makes them natural looking. Two appointments are often required to place a crown. During your first appointment, your problematic tooth is cleaned and dried. 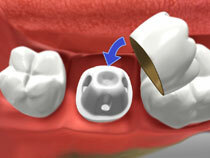 The decayed portion is carefully removed and a temporary crown is attached to the tooth. Your permanent crown is constructed at a dental lab according to your tooth’s exact specifications. Once your permanent crown is ready, you’ll return to our office, your temporary crown is removed, and your permanent crown is bonded to your tooth. Have any tooth problems? Contact Uptown Dental Gig Harbor to set up an appointment today.